Three tiny moon rocks brought to the Earth by Soviet cosmonauts in 1970 are expected to fetch upwards of $1 million when they hit the auction block at Sotheby’s New York on November 29. The specimens weigh approximately .07 carats combined, so their per-carat tally could reach a staggering $14.3 million. By comparison, the highest price ever paid per-carat for a gemstone is $4.03 million. That record is held by the 12.03-carat Blue Moon of Josephine, a diamond that sold for $48.5 million at Sotheby’s Geneva in November of 2015. 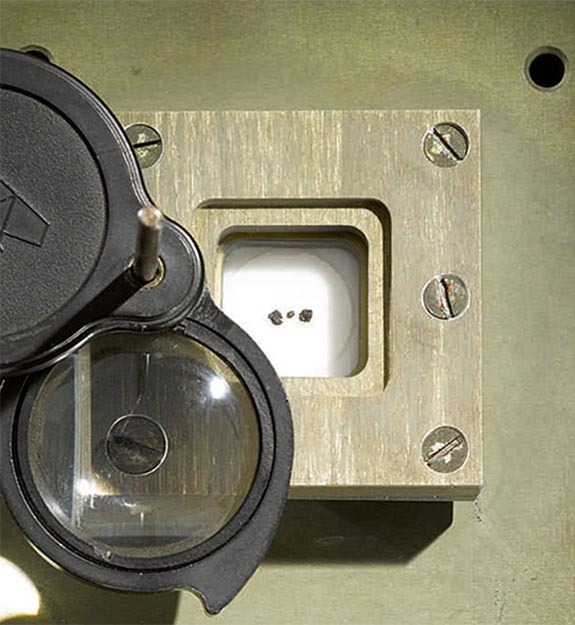 So, why are these minuscule moon rocks pegged to sell for seven figures? Because moon specimens available for private ownership are virtually nonexistent. While NASA reportedly owns 842 pounds of lunar material retrieved from six Apollo missions dating between 1969 and 1972, the three moon rocks offered by Sotheby’s — two measuring 2 mm, and the third just 1 mm — are the only samples on the planet currently possessed by a private individual. 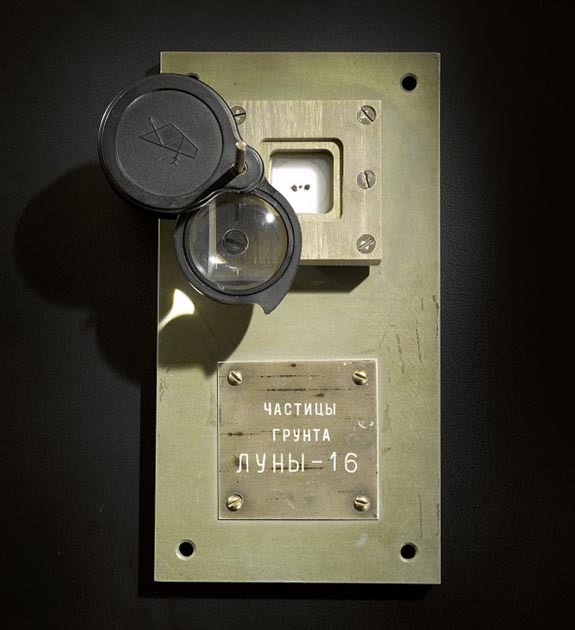 The moon rocks were retrieved during the Soviet Luna-16 mission and subsequently gifted to the widow of Sergei Pavlovich Korolev, the former “chief designer” and director of the Soviet space program. He is credited with heading up two monumental achievements — the launch of Sputnik, the first artificial satellite, and the flight of Yuri Gagarin, the first man in space. Nina Ivanovna Korolev first offered the moon rocks for sale at a Sotheby’s auction in 1993. The pre-sale estimate was $30,000 to $50,000, but aggressive bidding pushed the final price to $442,500. Now, 25 years later, the samples are owned by an anonymous U.S. collector and Sotheby’s has reset the pre-sale estimate to $700,000 to $1 million. CNN reported that space objects have been a hot ticket at Sotheby’s recently. A bag used by astronaut Neil Armstrong to collect lunar samples during the Apollo 11 mission fetched $1.8 million in 2017. The moon rocks are part of a larger “Space Exploration” auction, which will include a NASA Gemini spacesuit and a Soviet LK-3 lunar lander model. Sotheby’s New York will offer a public exhibition of the items, starting November 25.